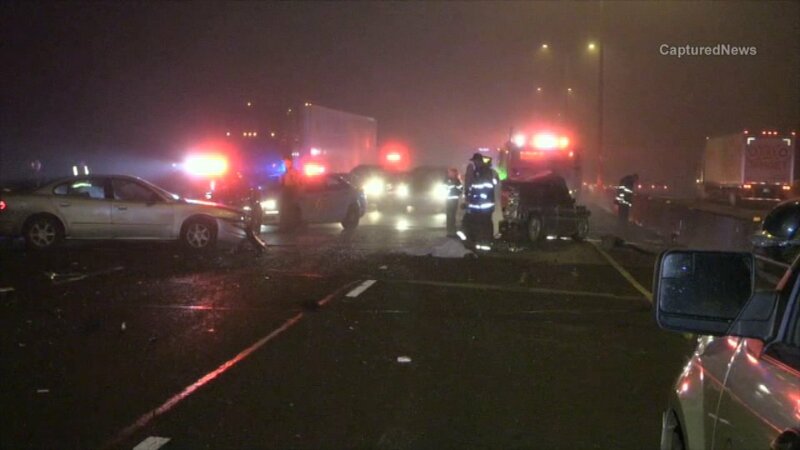 CALUMET CITY, Ill. (WLS) -- A woman from south suburban Calumet City was killed Sunday morning in a hit-and-run crash involving four vehicles on the Bishop Ford Freeway, Illinois State Police said. The victim was identified as 38-year-old Kristi L. Swopes, according to the Cook County Medical Examiner's Office. Swopes was heading south on I-94 in a silver 2012 Ford sedan around 4:25 a.m. when she tried to change lane from the left to the middle, just north of 159th Street. State police said the Ford hit a maroon 2010 Chevrolet sedan, spun out of control, struck a concrete median and ended up in the left lane and left shoulder, facing the wrong way. A silver 2004 Oldsmobile sedan hit the Ford, spun out and was struck by a red truck-tractor pulling a white semi-trailer, ISP said. That truck then hit Swopes, who police said was "standing in a lane of traffic." Investigators initially reported she had been thrown from the car. Swopes died at the scene. Witnesses told police the truck driver stopped briefly, before driving away without leaving any information. The 33-year-old Chicago woman who was driving the Oldsmobile was transported to Ingalls Memorial Hospital. Her injuries were minor. ISP said no other injuries were reported. All of the drivers were wearing seat belts. Investigators closed all southbound lanes of the Bishop Ford for more than four hours. ISP said all lanes re-opened around 8:40 a.m.
Police are still searching for the semi driver. Anyone who witnessed the crash or has information on the semi involved should call Illinois State Police at 847-294-4400.